"I've had a stiff neck because of a car accident. Dr. LaRock and his staff gave me my neck back! Spinal adjusting is our most important service. Not to be confused with spinal manipulation, which is non-specific, spinal adjustments are very specific and have to be performed exactly right. The objective is to correct subluxations which are misalignments of the spinal vertebra causing nerve interference. Dr. LaRock is one of the most highly skilled spinal adjusters in the country. High frequency sound waves heat up the body tissues and increase healing blood flow. This is especially helpful after injuries to ligaments and tendons. These tissues normally have very little blood flow which is essential for healing. Ultrasound can greatly speed up the healing time of inquires and tendonitis in tissues throughout the body. It is not needed for very condition but is very helpful in certain cases. Since his days as a chiropractic student, Dr. LaRock has studied kinesiology (the science of muscle function). He will manually test the muscles that support the spine in the beginning of your care. Some of these muscles will strengthen after the adjustments because the nerves that control the muscles will be functioning better without nerve interference. These muscles will require exercises to bring them back to full strength. As soon as possible he will start you on exercises to strengthen the muscles that we find weak. This is an important part of your corrective care. 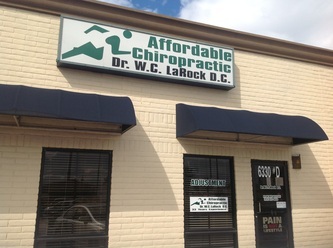 No other chiropractors in El Paso, or other health providers for that matter, have the combination of excellent spinal adjusting, chiropractic massage and muscle strengthening you will get with Dr. LaRock. Different forms of EMS are used by the chiropractic massage therapists to aid them in relaxing muscle spasms and decreasing pain. It is usually used with moist heat and relaxes the tight muscles so the therapist can massage the muscles more effectively. What is The LaRock Technique? Dr. W. C. LaRock gives special credit for his abilities to his favorite instructor at Logan College of Chiropractic, Dr. Dale Montgomery. Dr. Montgomery was partially paralyzed on one side of his body and had lost two fingers in an accident. He therefore had to develop techniques that were effective but required very little force to achieve excellent results. Dr. LaRock mastered the gentle techniques of Dr. Montgomery and combined them with other established chiropractic methods and many he developed on his own to create his own, unique method, The LaRock Technique. Headaches~ are mostly caused by pressure on nerves at the base of the skull and the top of the neck. Usually, there are misalignments from old injuries from falls, sports and auto accidents. Stress causes tension of the neck and shoulder muscles which pull the spine further out of place causing headaches. The headaches are the body's warning signal of serious health problems that can result if the underlying misalignments (subluxations) are not corrected. Taking pain killers and other medications only cover up the pain without correcting the problem. We will examine you thoroughly to determine the cause of your headaches and, if we can help you, we will recommend a treatment plan to help the headaches and the underlying cause. Hip and LegPain(Sciatica)~ are a serious condition caused by heavy pressure on nerves in the lower spine inflaming the sciatic nerve which runs all the way down the leg to the feet. Usually, by the time sciatica occurs, there have been multiple bouts with low back pain. Often there is already bulging discs in the lower back. As long as there is not a severely herniated disc, Dr. LaRock can usually help the condition and often completely eliminate the pain. Don't let this serious condition ruin your life. Come in for an evaluation immediately if you have sciatica. Auto Accidents and Spinal Injuries~ Most chronic spinal problems started with spinal injuries that were not corrected within the first 2 months after the injury occurred. This is because the torn muscles, tendons and ligaments healed with the spine still out of alignment. 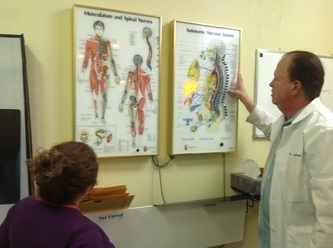 It is very important to have the spine examined by an expert El Paso chiropractor after and auto accident and any misalignments (subluxations) corrected and kept in place while the natural healing takes place. Dr. LaRock is especially skilled at this. Don't let a "minor" accident cause a lifetime of pain and ill health. Call us today and schedule your visit with Affordable Chiropractic! Neck, Shoulder, Arm and Upper Back Pain~ This condition is usually caused by pressure on nerves in the upper areas of the spine. There are many causes, (injuries, scoliosis, etc.) but the bottom line is: the spine is out of alignment and needs to be corrected. Adjusting this area of the spine requires special expertise which Dr. W. C. LaRock is especially skilled at. Since the nerves in this part of the spine also control the thyroid gland, heart, lungs and gallbladder, it is especially important that the correction be complete or other health problems can result if the nerve irritation continues. If you have these symptoms, don't hesitate to come in for an evaluation as soon as possible. Mid/Low Back Pain~ is a common problem but not one to be taken lightly. Every time you feel low back pain, misalignment of the vertebra are causing damage to the joints, discs and nerves of the spine. Over time this will lead to disabling conditions such as bulging and herniated discs which may require surgery. At the first sign of mid/low back pain come in for an evaluation. Dr. W. C. LaRock is very skilled at treating and correcting this condition. The earlier the problem is brought under control, the less likely it will result in disability. Spinal Corrective Care vs. Relief Care~ By the time symptoms occur, spinal misalignments have usually been existing for many years. The muscles, tendons and ligaments supporting the spine have adapted to the misalignments. Very good spinal adjustments, like those Dr. LaRock gives, can often give quick relief of symptoms. That is good, but quick relief can give people the mistaken impression that the spine has been corrected. Nothing could be further from the truth. To stop the spinal decay which results from long term misalignment and prevent reoccurrence of symptoms, it is necessary to continue the adjustments and therapy to retrain the muscles and ligaments. Dr. LaRock will give you the corrective care plan that suits you, call today and schedule your appointment! Peak Performance~ Chiropractic is also used by athletes at every level of competition, from the weekend warrior to the Olympic athlete. Many athletes utilizing chiropractic care aren’t just getting treatment for specific symptoms, but recognize that chiropractic adjustments greatly increase performance! Increase your performance and schedule your chiropractic appointment today with Affordable Chiropractic! Famous People Benefiting from Chiropractic Care~Jerry Rice, Hall of Famer and retired NFL star is among many top performing athletes who cite chiropractic care as essential to their success. Other legendary athletes who spread the word and endorse chiropractic include: Michael Jordan, Lance Armstrong, Emmitt Smith, Joe Montana, Tiger Woods, Arnold Schwarzenegger and Evander Holyfield.